"How do you spell Torchwood?" Lois takes a call from Captain Jack. Here are more screencaps from Part One of Torchwood: Children of Earth. *Spoiler Alert* for some photos. If you need a recap of the episode, you can read my Torchwood article at AC. *CLICK* the Torchwood pics for larger images. Ianto and Captain Jack race into action. Captain Jack and Gwen observe one of the possessed children. Back at the Home Office, Lois fishes for info. The Prime Minister talks cover-up. Ianto visits his sister and niece. Mental patient Clement McDonald feels safe with Gwen. 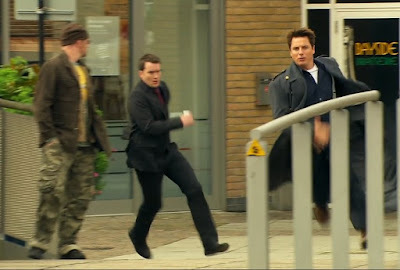 Torchwood: Children of Earth Screencaps Part 1a. Torchwood: Children of Earth Day 2 Screencaps, w/naked Captain Jack. John Barrowman as Captain Jack Harkness, Eve Myles as Gwen Cooper, Gareth David-Lloyd as Ianto Jones, Cush Jumbo as Lois Habiba, Nicholas Farrell as the Prime Minister, Lucy Cohu as Alice Carter, and Paul Copley as Clement McDonald, Torchwood: Children of Men Part One screencaps, c2009 BBC Wales, BBC America.